The biggest, baddest Pride celebrations tend to go off in coastal-elite cities like New York City and San Francisco, sitting as they tend to do in the big coastal-elite states. It was in New York City, after all, that the local LGBTQ community stood up to police raids on Stonewall Inn in June 1969 and set the stage for the modern gay rights movement, including the rise of Pride parades around the country. 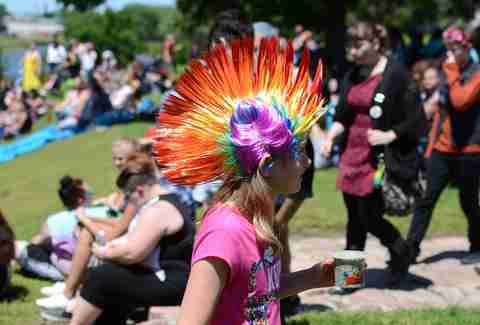 Meanwhile some of America’s absolute raddest Pride celebrations -- the large as well as the small -- have sprouted in the sorts of environments where the default mood still seems to be, at best, that parades turn children gay. Organizers and parade-goers are of course still targets for harassment in blue states, and those Prides are no less meaningful. But there’s a particular feeling of hope and warmth that comes from seeing people enjoy Pride events that were even harder to establish, which overcame even more homophobic attacks, more homophobic politicians, more pressure from homophobic organized religion. The more popular the celebration, the greater the accompanying frenzy of brands and politicians slapping a rainbow on everything in sight, and this is true of red state Prides, too -- see, for instance, Atlanta’s new $200,000 taxpayer-funded rainbow-colored crosswalk (in permanent marker, as it were, not like just for Pride week). Whether Pride should be a protest or a party is an ongoing discussion that applies to the deep South just as much as California, but if you’re looking for the red-state Prides where you’re going to have a very, very good time, you have come to the right place. If you are looking for Prides where your participation also functions as an extra-large middle finger to Ted Cruz (or Marco Rubio, Orrin Hatch, Mike Pence…) you have also come to the right place. Here are the best Pride celebrations among the 30 states currently colored red on the presidential electoral map. In a huge win for the LGBTQ community in red-as-hell Mississippi, and for the forward movement of civil rights in this country generally, the citizens of Starkville came together to pull off their very first Pride this year after local officials initially denied them a parade permit. Mississippi is known for having among the worst track records with gay rights of any state in the union, and this year the residents of Starkville -- a college town, home of Mississippi State University -- made it clear that they will show up in spades for equality. After the Board of Aldermen first attempted to shut down the parade organizers, it was the overwhelming response from the community that led to the permit denial being overturned. The ordeal became such a flashpoint that Pride organizers from around the country rallied behind Starkville, too. Every Pride is a party, but the Miami Beach Pride is like... a party party. 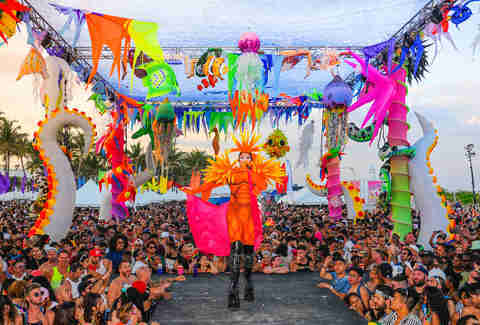 The weeklong festival leading up to the 2018 parade was stuffed with DJs, drag performances -- including the beloved Miss Miami Beach Gay Pride Pageant -- a Moonlight screening, more than 70 floats, 125 vendors, and a fireworks display. 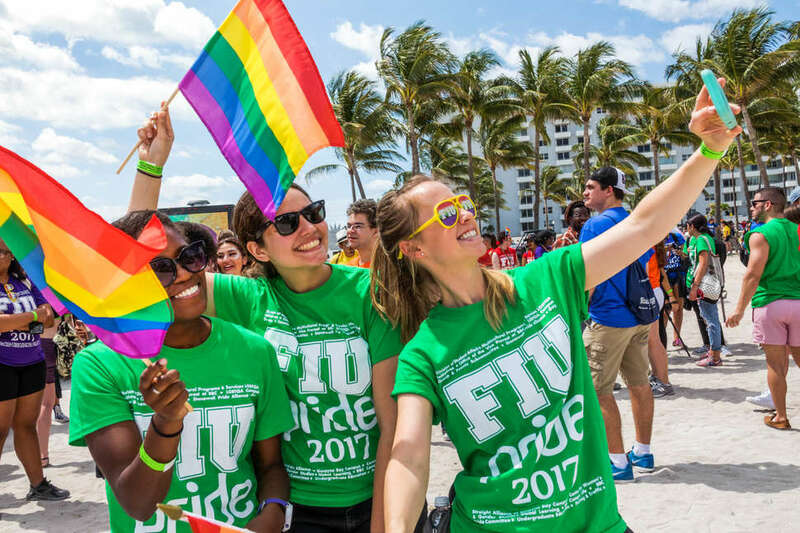 This year marked Miami Beach Pride’s 10th anniversary, but it also marked the second year that downtown buildings were lit in rainbow colors -- a tribute to the 49 people massacred at Orlando’s Pulse nightclub in 2016. Coverage of the 2018 festivities revolved largely around an attack by four men on a gay couple who were leaving the bathroom at a Gay Pride event; it was later ruled a hate crime. If convicted, the attackers could face up to 30 years in prison. There are a lot of great things about Miami Beach, including the Good Samaritans who saw the attack and rushed in to help the victims. Don’t judge all the state’s residents by just the ones who run for president. Florida: they’re not sending their best people. Salt Lake City Pride is populated by scores of LGBTQ ex-Mormons, some still struggling to reconcile their identity with their upbringing and some who have been able to make peace with the two. 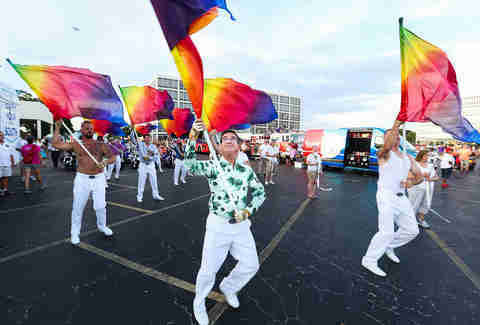 There are also, each year, Parade floats of Utah’s LGBTQ residents and allies who remain active members of the Mormon church. In recent years, there’s been a greater push for the church to become inclusive of non-straight couples that makes Salt Lake City Pride a scorching hotbed for activism and political tensions alongside all the celebrating. 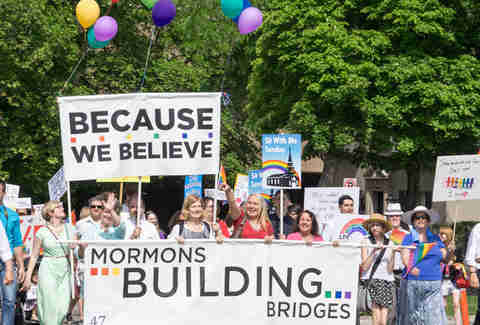 Mormons Building Bridges is the most high-profile of what are by now several groups of active Mormons marching in the Parade each year. All Pride celebrations shape their host cities in some way, but Salt Lake City is one where you can feel the change, the momentum surging forward in real time. And you’ll have too much fun while you’re there -- the Pride events are too high-profile at this point to attract anything less than absolute top talent, including your favorite RuPaul’s Drag Race queens. This is the kind of thing that makes you want to go to South Dakota. Sioux Falls Pride has been rapidly expanding the last few years, and the week leading up with the 2018 parade will include an open-mic night, an arcade night, comedy, cabaret, and karaoke, plus rooftop drag bingo, drag queen story hour, and drag brunch. Das a lot, but incredibly we haven’t even gotten to one of the draws that makes Sioux Falls Pride so distinctive: Take a nighttime stroll through Falls Park, and the waterfalls will be illuminated in rainbows. Sioux Falls, if you didn’t know, is a burgeoning arts-and-culture center, and especially in the summertime is a hub for outdoor concerts, plus literature and poetry readings. South Dakota flies somewhat under the radar as a travel destination, but it’s actually an excellent one. Yes, it is a Way Big Supermajority Republican state, but if you wanna roll into one of the nation’s best Pride celebrations while being surrounded by some of the most awe-inspiring scenery in the American West, Sioux Falls is the Pride for you. Yeah, Florida continues to be its own weird thing, but the state’s surprising virtues are not, of course, limited to just Miami Beach Pride. We also have St. Pete’s Pride, into which some 200,000 people pour each year, making it very nearly the largest celebration in the Southeast (the largest is a bit farther down this list). In 2017, St. Pete introduced a new TransPride March to precede the Pride Parade, a welcome option for folks in the trans and gender non-conforming communities who haven’t always felt that the main parade is inclusive of their identities (a Pride-wide issue, not just a Florida one). The week ramping up to the parade is packed with events like an LGBTQ prom and a performance from Coco Montrese, lip-sync assassin and two-time Drag Race alum. You would guess that given Florida’s resting state of 1 million% humidity and the fact that most Pride parades take place in late June more people would want them to take place at night, but so far St. Pete’s Pride Parade is the only one in the state of Florida that actually does take place at night. This is no small feat considering its size: More than 5,000 marchers are expected to set off at 7:15pm this year. Ideally this means they’ll not be sunburned for the following day’s Pride Festival. Fireworks? Thank you for asking, yes there will be -- at 9:15, after which you can head to Quench Lounge for the afterparty. That’s just the official one though; St. Petersburg itself is kind of the after-party. A fair number of people might know Austin as Texas’s big liberal oasis, with Dallas probably right on its tail. And both of those have great Pride celebrations, it’s Houston (still a big liberal city, just not quite as famously liberal as its peers) that has the biggest Pride event in the Southwest United States. Houston celebrates its 40th Pride this year, and when it first began on the steps of City Hall it was the nation’s OG nighttime Pride. Today, you’ll find floats festively illuminated for the signature after-dark parade, which a few years ago was moved to the downtown area -- pretty much the only option for a city preparing to receive more than 700,000 people for a single event. The parade and festival might take place on the 23rd, but Houston really rings in Pride on the 14th, with the culmination of its beloved seven-week singing competition Pride Superstar. Texas was recently the site of the long saga of Senate Bill 6, which you probably know as the Bathroom Bill -- a defeated-for-now-at-least piece of legislation that sought to force transgender citizens into using bathrooms for the gender they were assigned at birth, not the gender with which they actually identify. Texas is far from an LGBTQ refuge, but that’s what make Prides like this one sweeter. And you show your own pride, or solidarity as an ally, while enjoying all the summer activities Houston does best, like getting seafood on Galveston Island and chilling on Lake Conroe. Like so many big metropolitan areas in red states, Atlanta is more or less an island of blue. But with an estimated 250,000 people in attendance in 2017, Atlanta Pride stands apart as the largest Pride in the Southeast, which is to say the largest Pride in the largest concentration of Americans likely to oppose it. The parade itself will be followed up with both a Trans March and a Dyke March on the 13th. 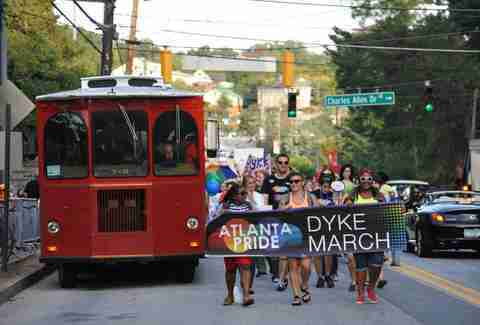 Unlike a lot of Pride events traditionally held in June to honor the Stonewall riots, Atlanta Pride is designed to support National Coming Out Day (October 11). But things basically kick off as early as September 22 with LGBTQ film festival Out on Film, and just because Pride here is officially in October doesn’t mean Atlanta’s hard up for June events and performers -- they even got Wanda Sykes and Tig Notaro. Given how obscenely hot Atlanta (Drag Race has taught me that one should never call it “Hotlanta,” but fight it out in the comments if you must) gets in the summer, October is when you might also have a better time doing your Atlanta bucket list. Tour one (or, y’know, a few) of the city’s many, many excellent breweries, then get wings from J.R. Crickets (that’s the order of operations I’d personally go with, but you’re welcome to be more sensible). Georgia lawmakers are currently doing their best to keep LGBTQ couples from adopting, so breaking the attendance record this year is a least not a bad place to show them that minorities are larger than they’re counting on. Grab your body paints, your feathers, your leathers, your lovers, go forth and exist loudly.